Dental Implants Help Smokers Get Teeth Back! Dental implants help smokers get teeth! Tobacco smoking has been around for many years, according to Wikipedia the practice of smoking tobacco has been known to have started between 5000-3000 BC. Tobacco smoking is very much a part of modern society with many millions of people still smoking today. Although the numbers of smokers is declining in the modern world, it is still increasing in numbers in the developing world. It is thought that developed countries have better access to information to create awareness of the bad health effects of tobacco smoking. In the mid 1950’s it was documented by British scientists that there was a direct link between tobacco smoking and cancer. 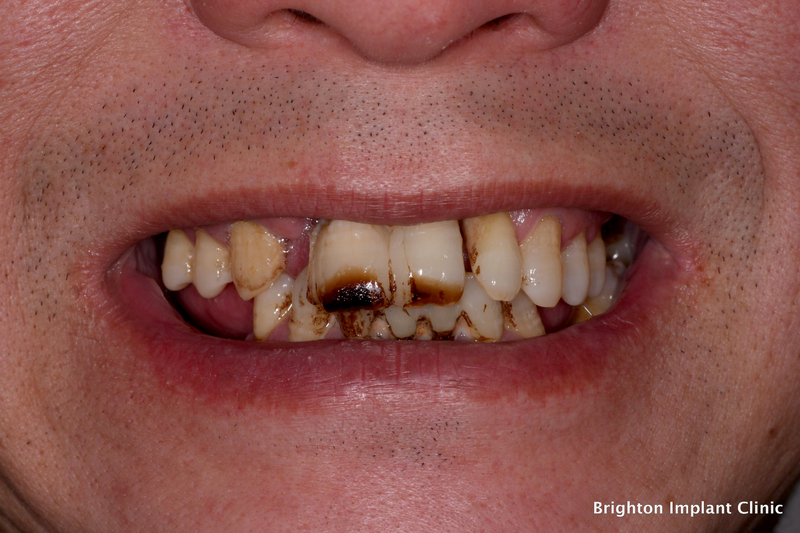 It was only later on that a evidence arose between the effect of smoking and oral health. 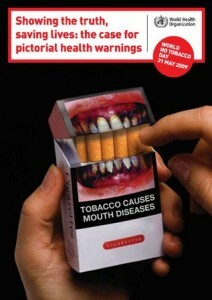 The most common effects of smoking on oral health is gum disease. Due to the substances found in cigarettes, these have profound effects on gum tissues as well as other tissues like the lining of the tongue as well as the roof of the mouth. 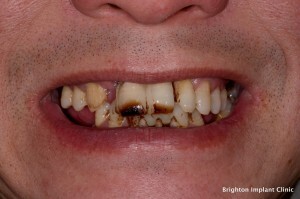 Teeth are stained due to smoking and this can be unsightly. Over time the staining and gum disease will lead to a poor appearance of the teeth. This can be accompanied with a overall neglect of the mouth and further accentuate the problem. Once teeth start to become mobile it is a sign of advanced gum disease. This means that the supporting bone holding the natural teeth starts to ‘give up’ and the teeth become more mobile. The long effect of this is that teeth will eventually need to be removed or will fall out themselves. Dental implants have been shown to be a safe and predictable way of replacing natural teeth. Even teeth that have been lost due to advanced gum disease can be replaced with dental implants. Implant are made of titanium and resemble small screws. During a small operation they are placed into the jaw bone and will with time fuse with the jaw bone. These implants act as anchors in the bone to which crowns, bridges or dentures can be secured to. A 50 year old patient came to see us with advanced gum disease. The patient had been a smoker for many years and used to smoke about 20 cigarettes per day. He promised his family to give up smoking when he turned 50 and so came to see us at our clinic as part of his treatment to restore his lost teeth. On examination we noted that several of the remaining teeth were stained and very mobile. It was decided that all of the remaining teeth needed to be removed as they were not restorable. A plan for fixed dental implants supporting full arch bridges was suggested to the patient. During a single day procedure, implants were placed into each jaw. The procedure usually lasts about 2-3 hours to complete. A provisional bridge is fitted onto the implants on the same day and most patients are able to return to a normal lifestyle after just a couple of days. The treatment is known as Teeth on 4 and has been extremely successful for many thousands of patients. The success rate of dental implants is usually about 95-98%. There is a higher chance of failure with patients who continue smoking however they are not ruled out for treatment. Heavy smokers are advised of the risks of smoking and stopping smoking before treatment starts is highly recommended.